THE various restrictions on the Nene have now been lifted with the river completely navigable. "If you are visiting the Nene and want to join the Friends of the River Nene, then pop into White Mills with £10 in cash, and we can sign you up there and then. We also have EA lock keys and maps available too, to help you on your way." 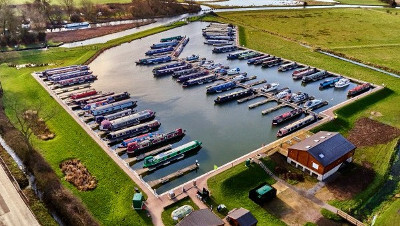 White Mills will be celebrating its second birthday on Sunday 1st April—here's a photograph of this attractive marina from the air.